Lilla Cross. © Paul Allison (CC BY-SA 2.0). Last summer, along with ADS colleague Jo Gilham, I walked 'The Crosses', a 53 miles (85km) loop in 24 hours to raise money for our local mountain rescue team. 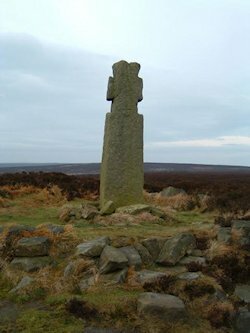 The setting for this challenge was the beautiful North York Moors and around 13 of the many crosses, way markers, boundary and standing stones that cover the area. For those that have traversed the moors over the centuries, and for us too, the crosses helped to punctuate the journey and mark our progress. They gave us opportunity to rest briefly and enabled us to reflect on the journey already undertaken as well as the journey yet to come. Temporal markers such as anniversaries serve a similar function and this year marks 20 years since Internet Archaeology's first issue was published. In fact later on in 1996, a York based consortium was granted funds from the then Arts and Humanities Data Service to establish the Archaeology Data Service so there is double cause for celebration and reflection this year. How so much has changed! The internet really was in its infancy in 1996. Internet Archaeology even pre-dates Google, Twitter, and Facebook. Nobody knew or had heard of blogging. Nor was there any sense that we would now be carrying around smartphones and tablets more powerful than Internet Archaeology's first office PC. But throughout the last 20 years, the journal has continued to publish diverse (as typified by this issue) and rich interactive content, from monograph length articles (e.g. Atkinson and Preston 2015) to 3D virtual models and even 3D files for printing (e.g. Milner et al. 2016). Internet Archaeology has moved and adapted with many of those wider changes, always willing and striving to innovate and experiment in its approaches to publication. The switch to open access is a case in point. Providing free, immediate, online access is the most effective way of ensuring that research can be read, integrated and built upon. As an open access journal, Internet Archaeology now creates more value than it ever did as a closed version. My job is rather unique in publishing as I am involved in (read 'do') every stage of the publication process and I simultaneously need to grasp the bigger picture, navigating the journal across, around and through whatever lies ahead, while equally being able to recall in detail almost every single step, obstacle and encounter that got us here. There have also been pressures and temptations along the way. One has been in the form of offers from larger publishers to take over the production of the journal, but every approach has been declined for we truly believe that something would have been lost, and so Internet Archaeology today remains true to its independent roots. I feel the unique path the journal has carved for itself is too valuable to abandon. I've worked at Internet Archaeology for 18 of the last 20 years, so it is impossible not to be woven into its fabric and to think of the journal as an extension of myself. However my enthusiasm for the journal is stronger than ever and the widespread and broad support, especially with our switch to open access, has brought its own rewards and made the journal busier than it has ever been. So I'd like to note all the hard work and help that I've had from every author, reader, referee, advisor and volunteer. This is the year we can celebrate our collective accomplishments and just how far we've come along this path. Internet Archaeology will continue to aim for excellence and innovation in digital publication over the next 20 years. There will be many more milestones undoubtedly, but it's what happens in between them that counts. To paraphrase Hemingway, it is the journey that matters in the end. Thank you for supporting Internet Archaeology in ours.